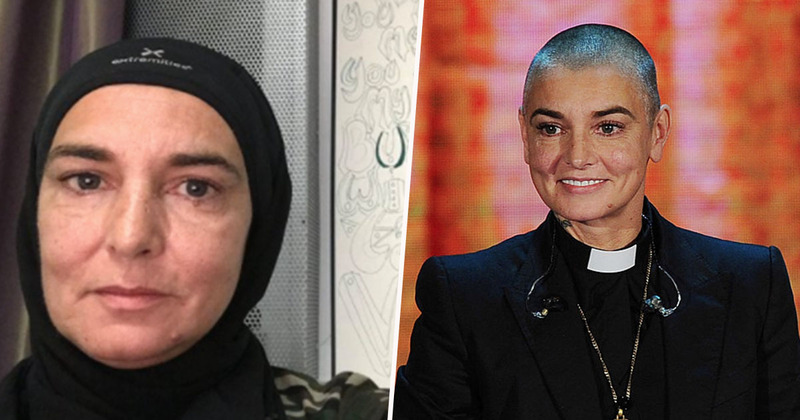 Sinead O’Connor has converted to Islam and changed her name. Her new name, which is said to translate to ‘martyrs’ or ‘witnesses’ in Arabic, comes after she previously changed her name to Magda Davitt last year. ‘This is to announce that I am proud to have become a Muslim,’ she wrote. Made by those who did not submit themselves as they ought have, to God. Who by the way never gets any royalties when people buy the Bible. The Irish singer famously tore up a picture of the pope during a Saturday Night Live performance before getting ordained by an Irish Orthodox priest in the 1990s. However, it looks as if those days are long behind her. My best friend Elaine just gave me my 1st hijab and she got chills all over her body when I put it on. She does, however, appear to be wearing some sort of head garment in her recent Twitter uploads, thought to be a hijab. Earlier this week she revealed she’d be collaborating with the Rolling Stones’ Ronnie Wood, actor Cillian Murphy, Pink Floyd’s Nick Mason and singer Imelda May for a new EP release.